How does it feel to be on top of the Himalayas ? I sometimes kind of feel silly to recommend a flight, even when I may not strongly recommend the destination itself. But I have never let my logical side come in way of my best experiences, and I’d not let that happen to you either. Himalayas is a special place, the lower altitude of the Himalayas are rich in fauna and flora, the reducing vegetation as it goes on top is compensated by increasingly beautiful panoramic views on top. The highest altitudes of the Himalayas are blessed with a snow cover through the year. But what if I tell you anyone can do it with little or no difficulty, to be on top of the himalayas. Ya, it is if you fly on top of them. The above is a picture I took during our flight, where the flight hovers on top of the Himalayas before it reaches the Kangra Airport. This exhilarating experience lasts nearly 20 mins. Due to the nature of the flights, small propeller flights are recruited to ply short distances between Delhi and Dharmashala. This also means, they predominantly fly low altitude and which in turn means you can view the entire Daulagiri range of Himalayas from above it. The first time I trekked or biked in Himalayas was extremely special. Although I strongly believe that the physical adversity of a journey heightens the joy experienced in journey, flying over the Daulagiri Range of Himalayas was most special because this was otherwise an unattainable feat, and an experience you must see to believe. 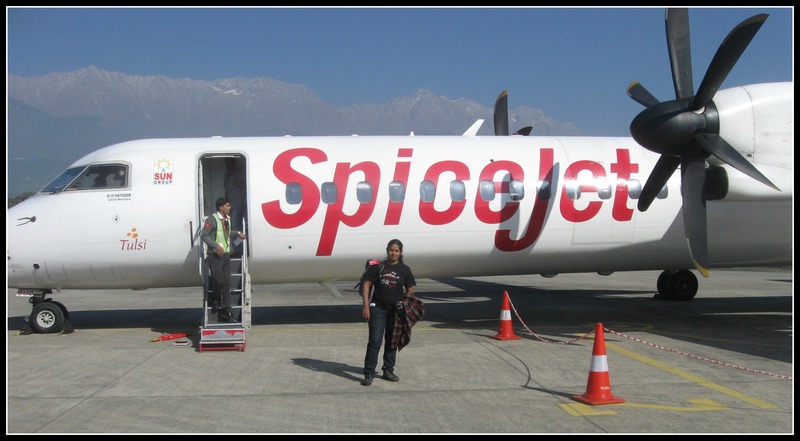 1) Spicejet runs commercial short haul flights between Delhi and Dharmashala, Kangra Airport. As the demand is not very high especially during the week, there may be some really good sale of these tickets. 2)The quickest way to get to Dharmashala or McCleodganj is through this flight. The alternatives are bus , not many Volvo at that and the trains reach only to Pathankot and the entire journey on road can be nearly 10 – 12 hours. 3)There is also a toy train that connect Kangra to Pathankot, which is a great mountain rail experience by itself. 4)Unlike most other airports the taxis run on Govt specified rates. If you are not in a hurry, you may ask your taxi driver to stop at note worth places on the way to the city. 1) Like I mentioned initially, I found Dharmashala a bit too touristy to my liking with lots of commercialisation which takes away the natural charm of the place. 2)There are some good treks around, none of which I tried during the trip, but otherwise a short one day tour covers much of the city. 3) There are hardly any Volvo buses that ply to this area, making the commute from Dhamashala to any other connecting place largely inconvenient.